Rule 5 has been appointed by Buy Art Fair to deliver the event’s 2017 communications strategy as it prepares to celebrate 10 years of cultivating an art market in the city. The single biggest art fair in the UK outside of London, Buy Art Fair presents new and contemporary works from established and diverse artists and galleries to first-time buyers and experienced collectors. In its 10 years, a total of £3million worth of pieces have been sold, including works by Damien Hirst, Tracy Emin and Grayson Perry. This year the event will be staged at Manchester Central between October 27th and 29th. MediaCityUK-based Rule 5 is tasked with further raising the profile of the event in its anniversary year and, new for 2017, Buy Art Fair Fringe, with a focus on driving coverage in national and regional consumer media. Activity includes artist and gallery profiles, tactical and creative campaigns, and news generation. 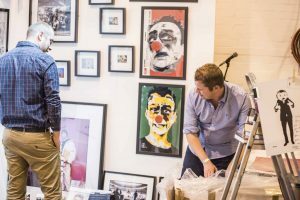 Thom Hetherington, Buy Art Fair's CEO, said: “Rule 5 has played a significant role in the promotion of Buy Art Fair over the years, helping to establish the event as one of the most celebrated art fairs in the country.